A man calling himself “Steve Samuels” with a thick Asian accent phoned us this morning from a WITHHELD NUMBER and said he was from the World Wide Web Consortium, in charge of the internet. He was going to switch off my PC because it was sending error messages. This was so absurd a concept that I laughed, which angered him. He told me that if I didn’t believe him I was to press my Windows key, but I couldn’t find it on my Mac keyboard. He then hung up, but three of his colleagues have called back with the same message in the past two hours. The callers were aggressive and persistent. I told them I believed they were scammers, and different people then called back from 020 3129 1891 to ask how dare I call them scammers. Although 020 3129 1891 is a London number the connection was appalling, as if I was talking to the Indian sub-continent. And mysteriously all the callers had pronounced “Indian” type accents — they could have been from Pakistan, India, Sri Lanka (how about that cricket T20 last night?!) Bangladesh or anywhere. One told me he was calling from Newcastle-upon-Tyne. He certainly didn’t originate from there, and he couldn’t explain why the phone was showing a London number. In fact he seemed upset my phone was showing a caller ID at all. I haven’t worked out what the scam is about. We never got to the stage where they asked for money, although once they learned I used a Mac they attempted to steer me to a website, teamviewer.com, which allows remote access to a computer. I wasn’t happy to go there, so I didn’t. What was it about? I’m much too sophisticated to be taken in by a scammer (although I’m delighted to report I now have $641.89 in my FanBox account, according to my daily statement). But every day scammers are becoming cleverer and more plausible, while I become more weak-minded and susceptible. It’s just a matter of time. My super-smart friend David was taken in by an early appearance of this now well-known scam, and as sure as eggs is eggs there will be a scammer with a higher IQ than mine plotting my downfall even as I type. But not quite yet. I’m not ready. Fryent Park is an undiscovered gem of North-West London. Undiscovered, because on my several visits there I have never encountered more than a dozen people. Compare that to Finsbury Park (affectionately known backwards as Krapy Rubsnif), Hampstead Heath or Parliament Hill Fields, where you have to tread gingerly between packed bodies. Maybe it’s because the beautiful 250 acre park is bisected by a large fast road, one of the dumber pieces of urban planning. Despite that the park just feels right, rus in urbe, and it comes as no surprise to learn that it originated as a landscape park designed for one Richard Page by Humphry Repton. 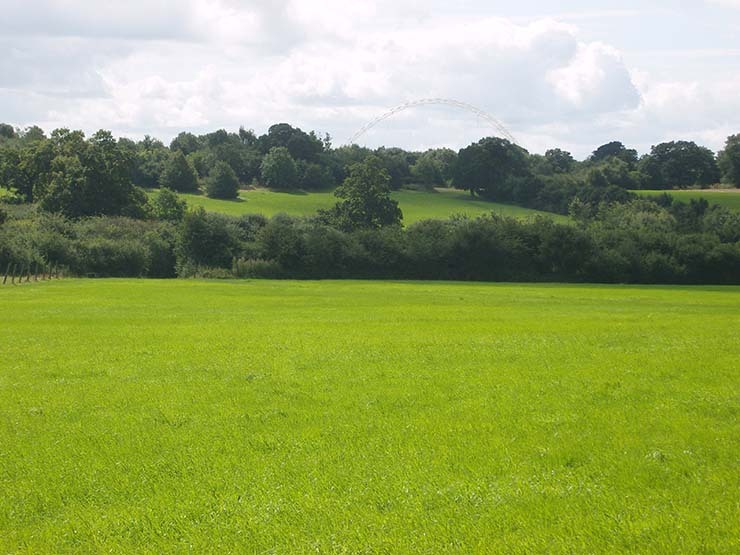 It has fields, copses, hills, hedges and must be one of the few places in Greater London where haymaking is still carried out. It’s here you will find London’s most succulent blackberries. In our cellar we have a bottle of delicious sloe gin made with Fryent Park sloes. And from the top of Gotfords Hill you can see the Wembley Arch (can you see it?). It’s a paradise for people, and dogs. Our Golden Retrievers have always loved Fryent Park, as you see — here is Milo as a young lad testing his speed in Home Field. We won’t be going there again. In the environs of Fryent Park lives a despicable human being, a cowardly, vicious, cruel and heartless murderer. On January 21st this scumbag placed poisoned blue pellets near a lay-by on Fryent Way, inside the park. A dog innocently ate them, and died in appalling agony. What fun that must have been for the poisoner. What a shame she couldn’t have been there to see the animal in its death throes, convulsing, terrified, helpless and uncomprehending, and to enjoy the pain, the desperation and the misery of its owners. Never mind, she could always do it again. And she has. At least twice more. A few weeks later, what looked like mouldy bread left on a grass verge in Salmon Street was gobbled up by three dogs. One of the dogs died, while two others survived. The following day two more dogs ate poisoned meat found in the undergrowth off the same street. One died, the other lived. Two bull lurchers and a springer spaniel gone; senselessly, cruelly. No matter how well you train your dog, if it finds meat lying around it will try and scarf it. Who could do this? I write ‘she’; it could just as well be ‘he’, but poison is favoured as a murder weapon by women, so I chose ‘she’. it could be a 14 year old boy, doing it for a laff. 14 year old boys are not human; I know, because I was one. I’ll use ‘it’ from now on. This thing not a proper human being. It doesn’t matter what gender this lunatic may be; it must be found and stopped. How? I have no idea. PETA is offering a £1,000 reward. What punishment should it get? I don’t know what the law allows — is it even illegal to kill a dog? I would love to devise a special punishment for this degenerate. How about poisoning it to the brink of death every month for a decade or two? Someone might know this person. It might even have a partner, a parent, a child. How would you feel if someone close to you was capable of carrying out such deeds? I can’t begin to express my revulsion.